If Europe is fractured, in disarray, plagued by an existential crisis, then you can barely notice here at Europavox. 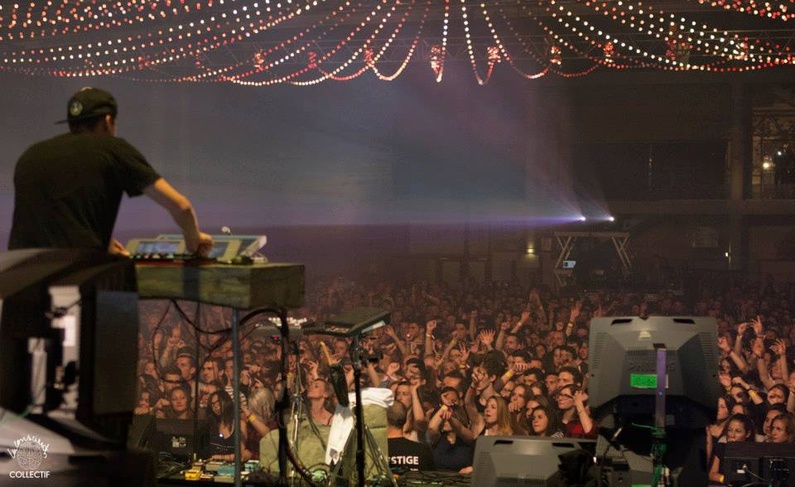 The festival, now in its tenth year, appears to be the most harmonious of unions, drawing upwards of 40,000 revellers of all ages to Clermont-Ferrand, in the Auvergne region of France, and hosting 50 mostly emerging artists selected from 22 countries. Those numbers may pale in significance beside heavy hitters such as Glastonbury (which attracts more than 175,000 people each day) and Roskilde (more than 110,000) but it is the celebration of discovery, diversity and unity that gives this humble event a higher purpose beyond mere escapism. To that list you can add “generosity of spirit” says co-founder and organiser Francois Missonnier, who also conceived Rock en Seine. A willingness to accept each other as individuals, often with different goals, but to also reflect on the things we have in common. For him, that is a love of music. A key partner and touchstone in the growth of the festival has been the Erasmus programme, which celebrated its 25th anniversary in 2012 and has now expanded to include more youth training and sport initiatives. Antoine Godbert, director in France, describes Erasmus as “a programme to help young people [both workers and students] to feel more at ease in Europe.” He sees this process of exchange as the best way to build a successful relationship, one where we are open to influences from the whole continent. So Europavox is undoubtedly EU-inspired, and openly subsidised, but is it anything more than a vanity project? How much ‘exchange’ is happening? What is it really like to be in the crowd? Are the acts actually any good? The EU fanfare is seductive, and being a Brit that’s just waltzed through passport control and into France quicker than it takes to scoff his first croque monsieur, I’m suddenly feeling a whole lot more European. But there is definitely much to appreciate, both on stage and behind the scenes. The first thing is the smart, on-the-ground network of journalists and venue managers that Missonnier and long-time bookers Francois Audigier and Didier Viellault have created. This not only ensures that there is a steady stream of new talent to choose from (the festival currently receives more than 1,000 suggestions each year) but there is also every chance that a relatively unknown act will ‘go international’. JoyCut is one example, an Italian band that went on to play at SXSW and hundreds of other gigs after getting their break at Europavox. A cursory glance at the posters of previous years shows just how timely Audigier and Viellault have been with their selections: internationally respected artists such as Baloji, Camille, Vitalic and The Cocknbullkid all played here at important points in their careers. The launch of a new platform called Best of U promises to accelerate this process and connect new acts – particularly those outside of the main markets – with enthusiastic venue managers and festival programmers. Ten years on, Audigier and Viellaut have not lost their touch. This weekend offers a few customary surprises. The Dø, a French-Finnish electro duo, wooed us with a combination of Olivia Merilahti’s ice-cold falsetto and Dan Levy’s scuttling beats. Merilahti is an intriguing figure on stage – swooping, sauntering and gyrating in her red jumpsuit beneath a giant curtain of long flowing hair as the refrain to ‘Opposite Ways’ cuts deep. Impressive light show too. Another duo, The Dumplings, produced an intense and occasionally melodramatic set that bellied their baby-faced innocence. From the bubbling electro groove of ‘Freeze’ to the caustic and plaintive strains of ‘How Many Knives’, the Polish group certainly know how to write a catchy tune. Their retro-future sound owes as much to eighties’ group Bronksi Beat as it does to progressive producers such as Dorian Concept. 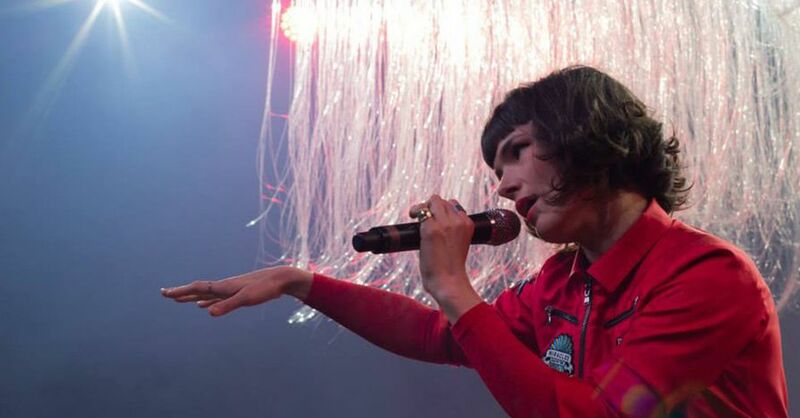 Other names that caught the eye include Robi, more dark wave but this time delivered by a classic French chanteuse – poetic introspection laced with jagged guitar and torrents of drums. “Le temps s’est arrêté,” she breathes on ‘L’éternité’. Apt. Only one thing can shake you out of that stupor – the relentless intensity of a Gojira set, my first metal gig no less. The controlled aggression all around me, even in the moshpit of bare-chested loons, was something to behold. Super Besse, three young lads from Minsk, pay tribute to Joy Division and the post-punk era with their angular and urgent grooves, singer Maksim interpreting Ian Curtis’s spasmodic moves for a new generation. Earlier in the day, a select few had been lucky enough to see the band play at the resort in Sancy that inspired their name. A bizarre yet sweet moment. London-based singer songwriter Denai Moore has been on my radar for a while and she took to the potentially intimidating Forum with consummate ease. It’s soul but not as we know it. Folksy torch songs such as ‘No Light’ stopped time and stirred emotions. Remember that name. On a completely different vibe, pan-global sound system Alo Wala won over a fairly subdued crowd on the overcast Scene Factory stage with a fusion of kuduro, trap, dancehall, “happy bass” and hip hop swagger. If there is one band that typifies the digital culture of today, where the latest favela dance craze quickly becomes the international club movement of tomorrow, it is these guys. Activist rapper Shivanai Ahlowalia is definitely a master of ceremonies – with or without live band Copia Doble Systema – and who better to lead this dance than a Punjabi-Indian rapper from Chicago who lives and works in Copenhagen? ‘Bend Yuh Backbone’ almost started a riot. Elsewhere, Bologna native GodBlessComputers demonstrated a knack for building tracks around catchy harmonies and translating the studio sound to the live arena. Sadly I missed one-man band Bror Gunnar Jansson and his gutbucket brand of blues and garage rock, but there is no denying the man has serious talent, not least as a storyteller. Six-string in hand, he conjures a delta of the mind, in homage to the likes to Howlin Wolf and Bukka White. It’s no mean feat having a 5,000-capacity venue eating out of the palm of your hand but the 25 year old carries herself with such confidence it’s inevitable. She has great vocal range, oozes charm and works the stage. She may look like the girl next door but performs like a sassy sista, crackling with energy, cocking her head and punctuating the odd line with an “uh”. Every artist needs their quirk, their sound and hers are those unique vocal inflections and contorted phrases – an amalgamation of Erykah Badu, Jamaican patois and countless other people and places she has experienced. The spirit of MTV Unplugged-era Lauryn Hill also comes through strongly, especially on ‘Freedom Time’. Then there are the songs themselves. Sue seems to deliver universal, hands-in-the-air hits at will, include ‘Alone’ and ‘Ragamuffin’, but with a rootsy edge – choreography not required. Sure, the top stars may have better songs but she can perform hers in a number of ways and that’s star quality. So that was my experience. Eyes opened, ears pricked and heart warmed by a number of new friendships. Superb hospitality and a well-managed event, not least by the sound engineers. Let’s not pretend that issues within the EU can be tackled at a party. I don’t think you’ll find any direct solutions here to the restrictive bureaucracy and profligacy that plagues progress within the union. Nor the troubling rise of extremism triggered by immigration issues, and stoked further by ill-conceived welfare systems. However, I believe in collaboration and pursuing a common good. Europavox – part festival, part trade show – is a fine example of both and should give us all hope for the future.